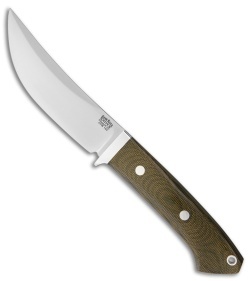 This Classic Trailing Point Hunter knife is built with a CPM-154 steel blade and a Green Canvas Micarta handle. Bark River's Classic Trailing Point Hunter fixed blade has the best features of the Classic Drop Point handle and their traditional trailing point blade. The blade is slightly wider and longer than the drop point variety to maximize slicing and skinning capability, while a swedge creates a finer tip for precise work. Includes a handcrafted leather belt sheath.